Description: Burdened by a dark family secret, Virginia Fortescue flees her oppressive home in New York City for the battlefields of World War I France. While an ambulance driver for the Red Cross, she meets a charismatic British army surgeon whose persistent charm opens her heart to the possibility of love. As the war rages, Virginia falls into a passionate affair with the dashing Captain Simon Fitzwilliam, only to discover that his past has its own dark secrets—secrets that will damage their eventual marriage and propel her back across the Atlantic to the sister and father she left behind. Why I Picked This Book: I've really enjoyed previous books by Williams and this involves family secrets, estates that need to be settled, mysterious deaths and all kinds of things that are essentially my reading catnip. My Impression: How did I make it until 2017 without reading a book by Beatriz Williams? To be fair this is my 3rd book this year so I'm making up for lost time but still! I think this is my favorite book yet. The other books I've read are typically set in New York and surrounding areas but the majority of this one is set in south Florida. 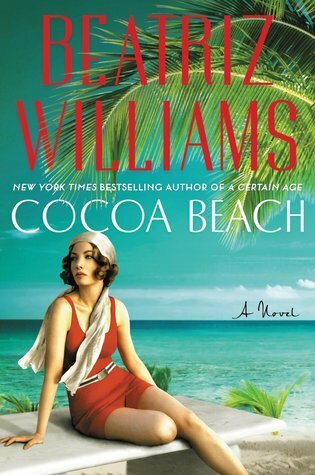 But Williams brought hot and humid Florida alive just as vividly as chilly grey Manhattan had appeared in A Certain Age. This book feels so much more ominous than the previous books that I've read by her. Maybe it's the sweltering heat that seems to ooze from the pages that changed the atmosphere but whatever it was I'm not complaining. I wanted to know what was going on. What was truth and what wasn't and what exactly happened in France and before the fire. The bulk of the book is set in 1922 with flashbacks to 1917 where Virginia and Simon meet. Not everything we learn in 1917 matches up with what's going on in 1922 so I couldn't wait to find out how everything connects and unravels. I really loved Virginia and I adored her daughter Evelyn. Virginia is smart and tough. Her life has been a tough one and she's a survivor, fiercely protective of those she loves. Evelyn is adorable and gives Virginia a little bit of vulnerability and softness without being too precocious or taking over the book. One thing I love about Williams' books is that they're all connected in someway. Virginia plays a tiny part in A Certain Age and the story of her family is a major subject of that book. While these are completely stand alone books there's an added enjoyment of getting to dig deeper into a character's back story or learn more about side characters with each new book. While I'm fairly new to Williams' world she has quickly become an auto-buy author for me. With the mystery, the secrets, and the characters this one might just be my favorite. Would I Read More of this Series/Author? Absolutely! I'm looking forward to reading more of Beatriz Williams' books while waiting for the next one to be released! Would I Recommend this Book? Absolutely! Anyone who enjoys a good fiction read with memorable characters would really enjoy this book. Good to hear you loved this one, I have yet to read this one and A Certain Age although liked the mystery and secrets in The Wicked City. Some catching up to do. Prohibition-era Florida with bootleggers and secrets, and flashbacks to WWI- this does sound like a winner! I love this era and I'm curious about the secrets she uncovers. I haven't read any books from this author and I have to change that this year. This is a great review! Sounds good. I don't know why sizzling popped into my head. To imagine a woman during that time trying to uncover truths where I'm sure during that time period it could have been a lot harder than trying today. I think you have convinced me that I really should pick up Beatriz Williams. This sounds like a great book.